Sean Wang came up with the idea for Runners fifteen years ago, but it didn't make it out to the public until 2000 in a Small Press Expo anthology. Wang self-published his first Runners volume from 2002-2005, and reprinted the whole thing as a TPB later that year. In February of this year, Wang began serializing the story online for free with the intent of following it up with all new material at the first story's conclusion -- sometime in late August, I think. THAT story will be collected in TPB form and available for sale afterwards. Runners is a story about a small group of interstellar smugglers just trying to get by in a harsh and intimidating universe. It's been favorably compared to Star Wars: A New Hope and Firefly. 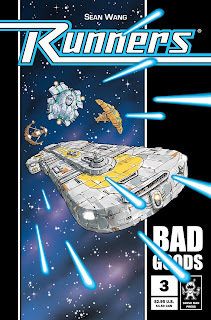 It's got aliens and starships and blaster fights and pirates. It's got a diverse, well-rounded cast; excellent writing and art; rock-solid storytelling; and an intriguing storyline with some clever twists. It's one of the best straight-up science fiction comics I've ever read online. When I first started switching my primary comics reading from the pamphlet to online formats, I was looking for stories that contained at least some of the elements of stories I'd enjoyed in the past. I'm partial to science fiction over fantasy. I like stories that are plot-focused but character-driven. I enjoy a larger central cast, instead of a single protagonist. I prefer "clean" linework. I enjoy seeing characters who are stuck without whatever resources might be normally available to them, forcing them to rely on wit and cunning. There were certainly comics out there that had some of those elements, but it's rare to find them all in one. Which isn't to say I couldn't find anything worth enjoying, of course, merely that they hadn't wrapped ALL of my favorite elements into one story. I was 6 when I first saw Star Wars and that movie, for all the hype over the decades, really did do a lot to shape what I grew to look for in a story. The small band of unlikely outsiders doing what the needed to do to get by in a harsh reality, but doing it with a sense of purpose and determination, and not letting the impossible odds get in their way. They used skill and cunning, as well as force and the occasional tactical retreat, to act true to their sense of value and purpose. I saw that on display again in the John Byrne issues of Fantastic Four that really brought me into comics, and later still with Joss Whedon's Firefly. I like to think I read a fair amount of comics online and, not surprisingly, I enjoy some more than others. But I have to tell you that, even after reading Runners every weekday for a couple months now, I still get an excited little "Oh, boy! Another page!" every time I see a installment pop up in my feed reader. You read that right: every weekday. No exaggeration; it really is some great work. I've really been loving the current "Bad Goods" storyline and can't wait until he starts adding color for his "The Big Snow Job" story! Hey Sean, Thanks for the awesome review! Funny you should mention all those attributes you were looking for in a book. Those are pretty much all the exact reasons I started RUNNERS in the first place, as I was having the same hard time back in the 90's finding all those things in a book to read myself. Anyway, I'm really excited to see others enjoying RUNNERS as much as I've been enjoying working on it. And I can't wait for people to see the new color series in Sept! Thanks again!